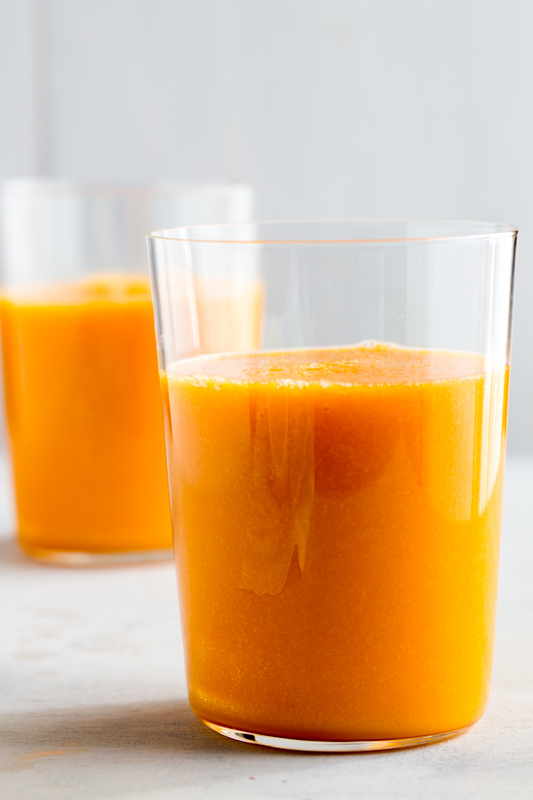 Bright, vibrant Carrot Breakfast Juice is a sweet and healthy way to start your morning. Welcome to my very first Smoothie Saturday! On Thursday, I started talking about a little journey that I’ve taken recently to get myself back on a healthy eating track as well as shared my immediate and all encompassing love for my new Blendtec Blender. I’m still in awe of it’s sheer power. The subject of this post isn’t an easy thing for me to talk about, but I’m hoping that if any of you have ever felt this way, now you know that you’re not alone. Over the winter I fell off the healthy eating wagon. I’m not sure if it was the bitter cold, or the lack of sunlight, but I hunkered down and just got complacent. Things that used to be ‘special occasion’ treats became every meal treats. Dessert, snacks, packaged foods, holiday treats, cocktails. It all got to be too much and before I knew it, I was up quite a bit in weight and all of the clothes in my closet fit just a bit too tight. Ok, more than a bit too tight. There where entire outfits I just avoided because I didn’t want to face reality. This was a very hard thing to deal with, and still is, because I worked so hard after having the Baby to lose my baby weight (now 4 years ago) and for the most part, keep it off. And after all of that hard work, I feel like I blew it. I let excuses about food blogging and busy schedules keep me from taking care of myself. And to make matters worse, this was the exact feeling I had last year, about this same time. So I felt doubly embarrassed and even more like a failure. I needed to try a new approach, something that I hadn’t tried and given up on before. It was as if I needed to hit a reset button and just break out of my crappy eating habits once and for all. I’ve heard a lot of good things about juice detoxes, but I was scared of trying one. It seemed too extreme and frankly I have never been about weird alternative diets. I have always been a proponent of eating healthy foods and moderate portions, but clearly I had thrown my standards out the window. Our friends had told us about a Blender Babe Juice Detox that they had done after Christmas and I got to thinking that could be a good thing to try. I had to giggle at the name, but after doing a lot of research about store bought juice detoxes and green smoothie cleanses, I really got on board with their method. For five days leading up to the detox, you gradually cut foods out of your diet to help your body assimilate to the detox better and avoid major shocks. For the five day prep, you can’t have processed foods of any kind, alcohol, gluten or caffeine (that was the hardest for me, and more on that in a bit). Then you go on the juice detox from 1-5 days, depending on how long you choose to do the detox. I did the juicing for 2 days and that was a good amount for me. After your juice days, you follow the prep days for the next 5, but in reverse so that you are gradually adding foods back into your diet. I loved the idea of this gradual change but also having the detox go for 12 days to really try to break my bad eating habits. The actual detox was an amazing experience. The five prep days were shockingly difficult for me, especially the first day. You see, I had gotten so overboard with the amount of coffee I had been drinking that it had reached the dizzying amount of 4-6 cups a day. I was absolutely reliant on caffeine. And while I knew that and joked about it, I had no idea that my body would react the way it did when I went off of it cold turkey. Headache does not begin to describe the pain I felt the first day. My vision was blurry, I was almost concerned to drive due to the fact that my head throbbed so badly. I was a mess. But that mess that I became was the best wake up call I could have gotten. I clearly had completely lost touch with what my body needed and vowed to myself not to do anything to put myself through that again. It was terrible. The next day (day two of the prep) my headache was gone, but the aching moved south. Now my entire body ached as if I had a terrible case of the flu. My body was in full detox mode and I was feeling it. Come day three, the aching was there, especially in my legs and back, but oddly, I felt wonderful. My head was clear, I had more energy in the morning than I had in a long time. Conversely, I crashed at 9:00pm. Days 4 and 5 were very similar. Aching, but mentally feeling quite good. I even took some detox baths and that did help with relaxing. The juice days were actually really fun. What I loved about this Blender Babes method is that you drink 6 whole juices, and their juices made in the blender so they have all the pulp and fiber and keep you full the entire day. This is in no way a starvation cleanse and it’s actually over 1800 calories a day – just all fruits and veggies. I am Sunshine (the breakfast juice) This was the most delightful orange and carrot juice that I had ever had and the inspiration behind the smoothie that I’m sharing today. I am Berry Sweet (mid morning juice) This was my least favorite juice, although it was the prettiest. The beets and cayenne pepper made this juice very difficult to get down. This is not one that I would make again just for kicks. I am Sweet (lunch juice) This juice was pretty good, although somewhat forgettable. Nothing offensive in it, though. I am Spice-C Hot (mid afternoon juice) This juice was awesome! I actually found it less spicy than the beet/cayenne horror from the morning time, and the flavors were bright and delightful. I am Grateful (dinner juice) This was like Thanksgiving in a glass – full of sweet potatoes and cinnamon – yum! I am Divine (dessert juice) This was essentially homemade almond milk and it was light and hit the spot at the end of the day. On the days following the cleanse, I was careful and thoughtful about what I chose to eat. One of those days was Mother’s Day and my husband and kiddos were so sweet and made me breakfast in bed, following all of the guidelines for that day. And that is my little sassy lady in a nutshell. And yes, he does know how to use the blender and since has been the one making us smoothies at night for our breakfasts. Because since the detox, I have been drinking at least one green smoothie or whole juice a day, either for breakfast or lunch. I know that it’s full of healthy foods and they fill me up so I’m not thinking of snacking all morning and afternoon. I have been bitten by the green smoothie bug (about 5 years late as I am with everything) but I’m so glad it’s happened. Overall, this detox did everything I hoped it would do. It helped me break habits, I lost over 6 pounds (and have kept it off for three weeks and have lost an additional 2). It kept me full and satisfied throughout the day. I never felt hungry. By the end of the second juice day, I did want to chew some food, but I wasn’t hungry. I liked how I could make the juices myself and even let the kiddos try them. They had fun watching all of the healthy fruits and veggies go into our new Blendtec and make a delicious drink. If you’ve been debating doing a detox or cleanse of any kind, i would recommend the Blender Babes detox. I am not affiliated with them in any way, shape or form, but I liked their system so much and because it helped me, I wanted to share it with you. This Orange Breakfast Juice is my riff on the I Am Sunshine juice that I loved from their system. I’ve been making variations on this since my first juice day and I just love it. 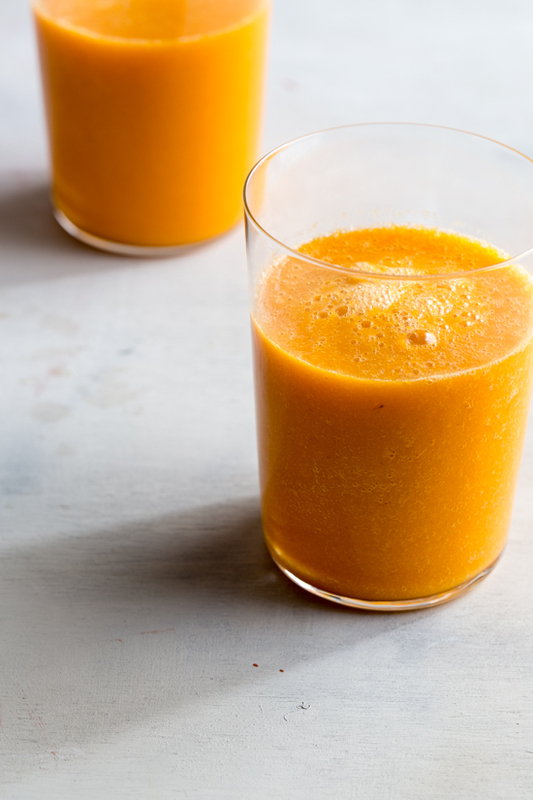 The carrot and turmeric together just create an amazing flavor combination that wakes me right up. Place all ingredients in a high powered blender (I used my Blendtec) an blend for 90 seconds or until all ingredients are liquified. Serve immediately or chill for later. Enjoy! 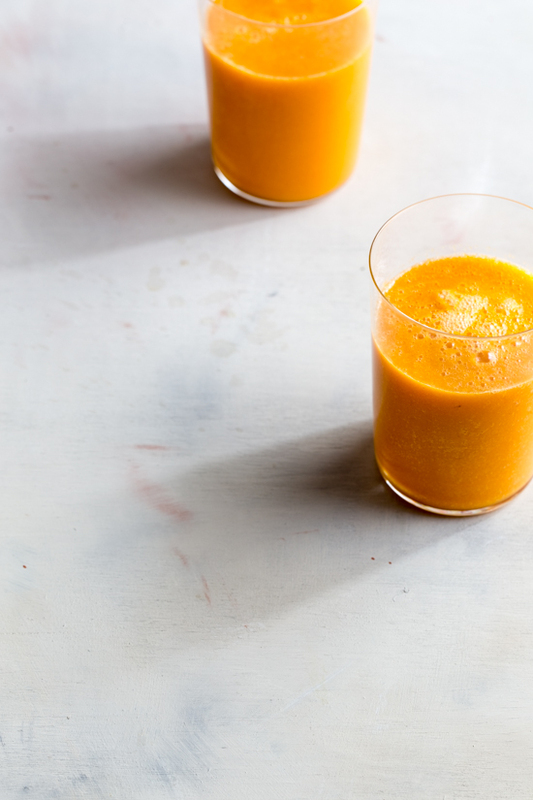 The turmeric is wonderful in this smoothie and you are right – the health reasons to use it are worth it alone! Thanks so much for stopping by, Lauren! I’ve been thinking about doing a cleanse since January (procrastinate much?) and I think I really just need to jump in and do it already! It’s not so much the caffeine withdrawal I’m worried about, but the sugar! Yikes. Cleanse or not, I’m going to be trying this lovely smoothie! After the whirlwind camping adventure I had this weekend, I could use a detox, too! It was nothing but s’mores and beer for 3 days, ha! I love the idea of making a fresh juice in my blendtec – must try this soon!! This is wonderful. I’ve been considering a detox for bit now. Great recipe, and it looks so vibrant. I am kind of a freak when it comes to detoxing. Have heard mixed things with juicing, and I think the sugar content is just so high. We do a cleanse at the beginning of year that involves brothy light soups full of only veggies. Works for us! Recently we jumped on board the Foodist approach with eating, and not only dropped some weight but felt great. It is really about eating normal healthy non-processed foods, and moving our bodies. We are planning on starting up again in the next week or two … after some traveling next week, when it is tough. I am with you! The idea of straight juice doesn’t appeal to me at all. All of the sugar and no fiber. I like the idea of doing soup cleanse. Is it something that you have developed on your own or is there a system/recipe/book about it? I know I’ll be incorporating more of these types of routines from time to time throughout the year. I feel like it’s a necessary reset button after times when things get too out of control eating wise (around the holidays for sure). Have fun traveling!! 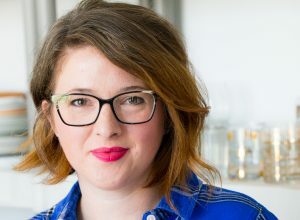 I’ve never really considered detoxing as an option, but it doesn’t sound too terrible (aside from the caffeine withdrawal, I’m sorry that happened to you!). Two weeks is a long time, but I’ll have to look into Blender Babe. Thanks for sharing!